When first built, this building contained a realtor’s office and a jewellers shop. Levi W. Myers, United States Consul, maintained a suite of offices on the second floor. Charles Redfern who owned the jewellery store, was Mayor of Victoria in 1883 and again in 1897-1899. One of the features of his store was a clock, clearly visible in the 1907 video. In 1907, in addition to Redfern, the tenants were A. Bancroft – confectionery and dentists Richard Nash and A. A. Humber. For many years in the mid-20th-century, this was the home of Brand’s Restaurant. 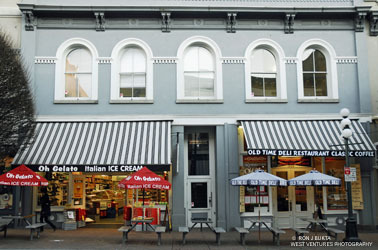 In 2009, the building is home to a Gelato shop and a coffee shop, with offices upstairs.